Note: Some 3rd. party links "Cannot Display in Frame" and require reader to click "Open in New Window"
Highly perceptive of you to make an association between the Unified Quantization of Spherical Singularity (UQS)....Ref: UQS Consciousness Investigation ... and Nassim's work. YES!!... Haramein, and others, to include Kelvin Abraham... Ref: Tetryonics.com... are investigating a Universal "Fundamental Mathematical Blueprint" ("Unification Geometry"), utilizing alternative 3D CAD matrix (coordinate geometry) environments to resolve the geometry of the Origin Singularity (Zero-Point-Vacuum). There is extensive criteria for "The Valid Unification Geometry" not addressed by the Haramein or Abraham presentations... i.e. the jury is still out... but evidence that digital visual media presentations are documenting the debate for the general public, is exhilarating!!! I am adamant that visual media exposure to the geometry of a Valid Universal Network (Unified Field) will enable utilization of the Cosmic Intelligence APPlication pre-installed on the individual human mental processor, and empower the species to detour what behavioral scientist, Dr. Konrad Lorentz --in his 1966 book "On Aggression"-- foresaw as the very likely and undesirable consequences of what he termed "militant enthusiasm" being "promoted by separatist demagogues". In retrospect I want to emphasize herein that a digital processor... e.g. 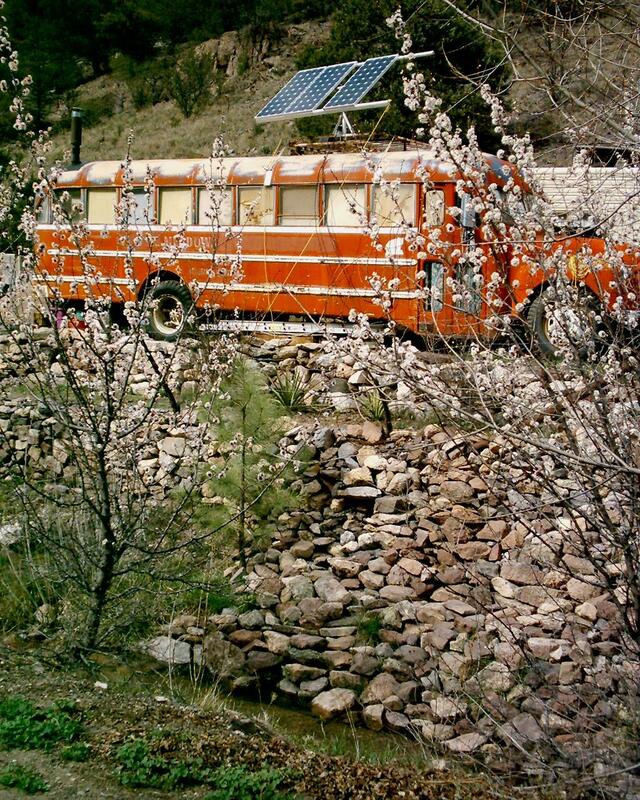 a human mind... utilizing a Unified Network, has logic functions available to it ... e.g. a minimum unit of Energy (QE) and a minimum unit of Space (QI)..., that can resolve Energy/Space/Time phenomena in a manner not available to a digital processer... e.g. a human mind... that can NOT verify an unbroken kinematic chain from observed phenomena to it's Energy Point Source. I am equally adamant that the quest to resolve the Origin Singularity as a Unified Base Unit Quantization has critical significance for a Quantum Energy Distribution model as required for code-decode of quantum Energy choreographies as information. Code-decode of quantum Energy choreographies as information, is a pre-requisite of atomic disassemble and re-assemble mechanix postulated by the Star Trek Replicator. On Pulse-One-Open of a Quantum Energy Distribution SIM, a Single Point Energy Source Encapsulation Quantization is the initial Spatial Path Dictate (discriminate component) of a Quantum Energy Distribution model. A Unified Base Unit Volume quantization of a Single Point Energy Source Encapsulation is required to mathematically define a unified minimum Quanta of Space (QI) as an occupancy address (spatial location) for minimum Quanta of Energy (QE) --QE equals Origin Energy Pulse (OEP) divided by available spatially defined QI addresses-- and establish a Unified Quantum Energy Switch mechanism to mathematically model a Universal Networked Intelligence. To verify Nassim's Single Point Origin Encapsulation Base Unit Volume... Ref: Excerpt from Nassim Haramein Black Whole Part 1 ... I froze video frame at 3:28, Printed Screen to Windows Clipboard, pasted image from clipboard to Paint Shop, zoomed in on the Cuboctahedron core, and edited the image with pink and blue dashed lines... Ref: illustration below. Note that there are 12 converging splines, 2 Base Unit geometry Planar types, --60/60/60=180degs. and 45/90/45=180degs-- a 7 Volume Emission Axis, and 2 Base Unit geometry Volume types... i.e. 8 of type Regular Tetrahedron, and 6 of type Pyramid. A "Geometry in Equilibrium" does not necessarily resolve a Unified Base Unit of volume, which is required to facilitate a unified minimum Quanta of Space (QI) for an infinitely expanding Energy distribution equal in all directions from a single point. In retrospect, Nassim's Cuboctahedron demonstrates that a quantization of a Single Point Energy Source encapsulated by Multi Base Unit Volume geometries --comprised of Multi Planar geometries-- does not offer the Origin Energy Pulse (OEP) mathematically defined unified minimum spatial units. 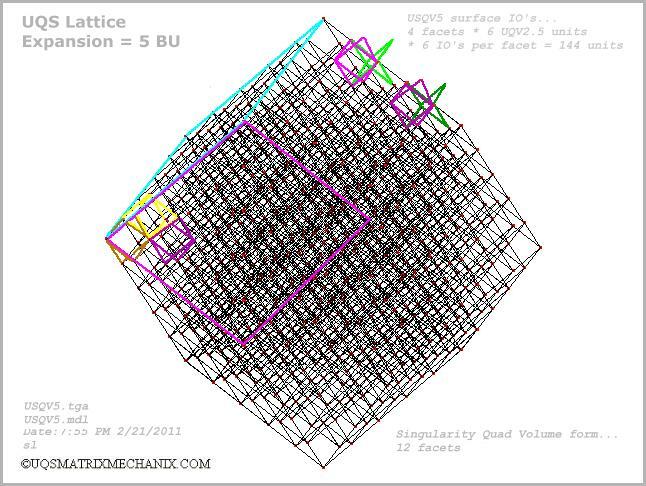 If the Planar Base Units that define the 2-D structure of the 3-D Base Unit Volumes, are NOT uniform in facet geometry.. e.g. all equilateral triangular faces of a Regular Tetrahedron CAD environment... within the Singularity, QE distribution mechanix at subsequent nodes (vertices) can NOT be inferred... i.e. not all nodes subsequent to the Origin node can emulate Origin node geometry or mechanix. was computationally reduced (inferred) on the basis that all UQS coordinate system nodes (vertices) are centroid to a Singularity of an equivalent geometry to the Origin Singularity (OS) unified volume unit quantization, which ensures that the center of inertia of any Energy entity choreography can be resolved in terms of the Origin Singularity (OS) spatial algorithm... i.e. verifies a standard LOGIC SWITCH mechanism. A Multi Base Unit Volume Quantization of the Origin Singularity Encapsulation introduces unnecessary mathematical complexities that brutalize the mathematics of Energy emission distribution resolve. Although such geometry complexities are seen in nature and may be necessary to facilitate valid QE Emission discretionary components as more complex Energy entity choreographies emerge, a UQS Quadhedron will Quantum Tessellate any spatial volume, and the very nature of a quest to resolve a Universal "Fundamental Mathematical Blueprint" ("Unified Net Geometry") suggest Occam's Razor be in hand for Origin Singularity resolve. The Quantum Energy Mechanix (Information) that emerges from QE/QI system wide Energy Distribution Resolve Inferred Functions of each sequential pulse, is the discretionary component of a Quantum Energy Distribution model. In retrospect, note that it is also necessary that the Available Intelligence (AI)... i.e. logic functions infered... on Pulse-One-Close provides the mechanix to facilitate subsequent Planar QI addressing in a manner that does not require division of minimum unit of Energy (QE) at subsequent nodes... i.e. a minimum unit must be singular and indivisible (no fraction of) --a fundamental concept to Energy Density calculations. If known link, please direct me... but to my knowledge Haramein has not yet demonstrated an Energy Emission Distribution SIM within the Tetrahedron CAD environment? Sequence (b.) illustrated below, verifies a minimum tessallating Irregular Tetrahedron Point Source Encapsulation, which facilitates 144 Multi Planar --45/90/45 = 180 degs. and 54.73/90/35.26 = 180 degs.-- minimum Units of Space (QI) as double surface addresses to distribute OEP, and has 22 Origin converging spline and 12 Volume Emission Axis complexity, but the configuration does yield a Unified Volume Point Source Encapsulation within the Singularity. In 1998, utilizing a minimum tessallating Irregular Tetrahedron CAD environment, I was unable to expand a suitable Point Source Singularity geometry in which all nodes (vertices) were geometrically equivalent. A Pyramid can be sub-divided by 4 Regular Tetrahedrons, but an additional Boolean volume unit is created. A Pyramid equal volume sub-divided by 8 Irregular Tetrahedrons introduces an additional planar unit. In retrospect that is to say that a Regular Tetrahedron, --"in which all planar faces are of uniform size and shape (congruent)"-- does NOT tessellate a Point Source Singularity, and all Planar faces of an Irregular Tetrahedron can NOT be of uniform geometric algorithm. However, an Octahedron can be equal volume sub-divided by 16 equal volume Irregular Tetrahedrons. This suggest that, judicious application of Occam's razor can reduce the complexity of either the Tetrahedron Singularity quantization or Nassim's Cuboctahedron Singularity quantization, and establish "Equilibrium" as 6 Octahedron with 3 Emission Axis, 8 Origin converging splines, and 24 initial unified Planar minimum Units of Space (QI) as double surface addressing to distribute OEP... Ref: (c.) in illustration below... but I can find no mechanism that develops decision capability (intelligence) required to sustain an Energy Emission on Pulse-Two-Close... i.e. on Pulse-1-Open the Spline logic element is defined as boundary of QE Spatial containment. In retrospect, I want to stress that a distinction must be made between criteria required for resolving a solid geometry and criteria required for resolving a Single Point Energy Source Encapsulation quantization of an Emission SIM...i.e. the UQS Singularity was not derived by stellateing, merger, or truncation. A Quadhedron can be derived by removing the four polygon base lines of the two composite Pyramids of the Octahedron... i.e. 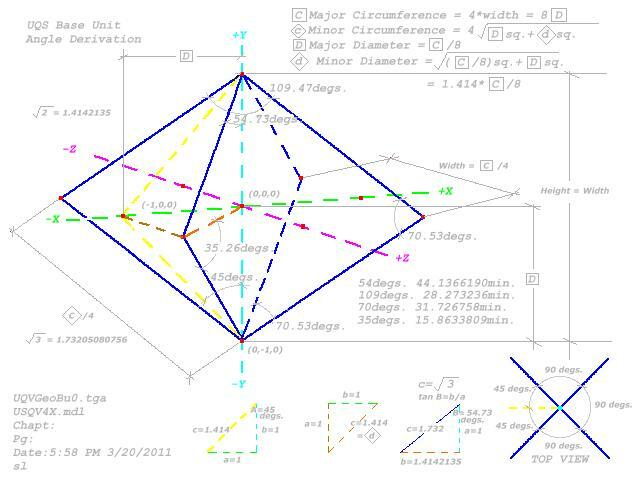 the Quadhedron is NOT a Tetrahedron CAD environment base unit volume. 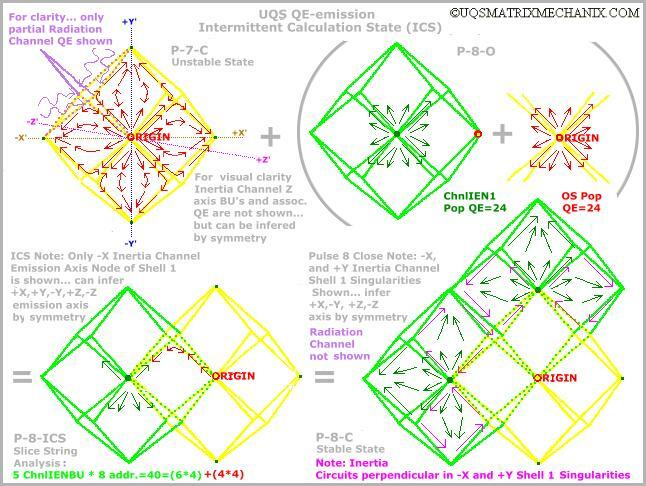 By Energy Emission SIM dictates, the UQS Quadhedron is comprised of 4 folded plane QI UQS Address Pairs... i.e. there is no triangulation spline dividing the folded Planar structure of the 4 QI Address Pairs that define the UQS Unified Base Unit Volume. Note that the tessellating Rhombic Dodecahedron emulates the exterior shell form of the UQS Singularity, but unless a centroid node (vertex) and Origin Point Source Encapsulation quantization is specified within the Rhombic Dodecahedron, the Rhombic Dodecahedron is the Unified Base Unit Volume of the CAD environment, and no planes are offered the OEP as QE distribution addresses. The tessellating Rhombic Dodecahedron can offer the OEP a unified Planar Unit when the Rhombic Dodecahedron is quantized to a Single Point Source (centroid) by 6 UQS Quadhedron, as illustrated in sequence (d.) below. Also note that the tessellating Rhombic Dodecahedron Origin Singularity can be Quadhedron quantized by 1/2 offset of a Rhombic Dodecahedron volume tessellation, and all subsequent nodes (vertices) in the offset tessellating Rhombic Dodecahedron environment are equivalent geometry to the Single Point Energy Source ... i.e. appropriately proportioned, does resolve as the UQS Quadhedron CAD environment quantization. To derive valid Quantum Energy Mechanix from any "Unification Geometry", it has been theoretically deduced that not only must the deterministic Spatial geometry support pulsed Energy distribution equal in all directions from the Single Point Energy Source, the additional criteria to sustain an Energy Emission SIM that utilizes the information generated by QE/QI system wide Energy distribution resolve inferred functions of each sequential pulse... i.e. self-modifying code as intelligence... Ref: Tommaso Bolognesi's July 21, 2016 at 9:05 am post to: Stephen Wolfram Blog: What-Is-Spacetime-Really .... requires that the Spatial quantization must infinitely emerge (tessellate) as successive closed shells of Origin Singularity Base Unit Volume radii. In retrospect, and reference to Wikipedia, the Stellated Rhombic Dodecahedron "can tessellate space by translational copies of itself", and it can expand as closed shells of Origin Singularity Base Unit Volume radii, but unless the Stellated Rhombic Dodecahedron is quantized to a Single Point Source (centroid), the Base Unit Volume of the Singularity is the unnecessarily complex Stellated Rhombic Dodecahedron. Although Nassim's "Star Tetrahedron" is a Stellated Rhombic Dodecahedron, quantized to a centroid by the Cuboctahedron, my to date investigation of Nassim's videos has verified only one "Star Tetrahedron" shell encapsulation of the Cuboctahedron core geometry. Not only does Nassim's Cuboctahedron Singularity not satisfy Pulsed Energy Emission SIM criteria for a unified minimum spatial unit (QI), the Multi Base Unit Volume Singularity Cuboctahedron Quantization geometry --comprised of Multi Planar units-- can not expand infinitely as closed shells of Origin Singularity Base Unit Volume radii in Nassim's Tetrahedron CAD environment... i.e. although the Tetrahedron is not distorted, the configuration does not support Origin Node emulation in subsequent nodes. In retrospect, I will reiterate that core geometry complexity and/or it's inability to unify node mechanix, vastly complicates the mathematics for QE Emission resolve... i.e. in order to justify any added complexity of field quantization geometry dictates, a requirement for expanded discretionary functions would need to be verified. Significantly, and in concurrence with UQS, Nassim does conceptually expand the geometry wire frame as a Planar structure that could define minimum units of Space (QI) as information addresses for accumulation of minimum units of Energy (QE), and he has identified two separate geometry structures --one within the other-- that could facilitate two channel Emission... e.g. radiation and inertial. 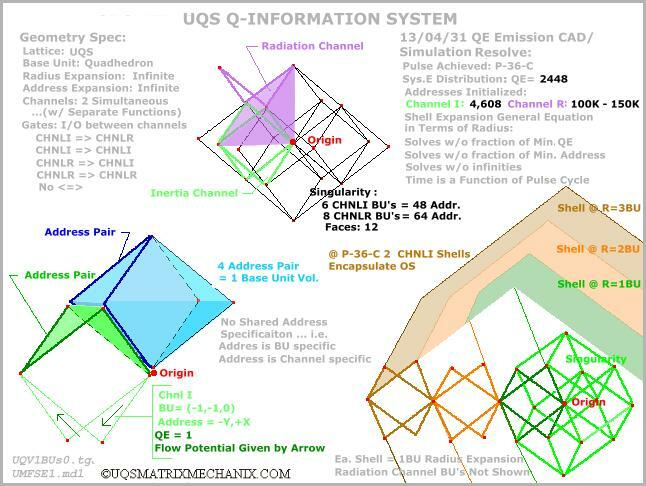 Although Haramein's Cubocahedron Single Point Encapsulation "Unification Geometry" does not concur with the UQS Quadhedron Base Unit quantization --which does support definition of a Unified Planar minimum Unit of Space (QI), and infinite expansion of Origin Singularity geometry, as closed shells of UQS Base Unit Volume radii... Ref: UQS Shell Expansion: 4 -- it is my conviction that as those of us attempting to verify a "Unification Geometry", continue to investigate QE/QI Emission SIMs as the discretionary component of an Energy Distribution model, we will resolve Einstein's legacy question --"What is the mathematical character of the Universe?". Ref: Orig. (04.1950) German Ver. With regard to any "Unification Geometry" of choice, digital simulation (SIM) verification of a Virtual Logic Quantum Computer prior to any Photonic IC casting of the geometry for implementation as a Quantum Phenomena Computer would be most expedient, and I have proposed and formatted a Virtual Quantum Lab Game... Ref: VQLabGame ... to test discretionary Energy Emission SIM's in generic deterministic CAD environments, to include the Tetrahedron environment. I have also promised the FQXi Forum TOPIC:1928 community, a frame by frame visual walk-thru of Pulse-1-Open to Pulse-36-Close of the UQS Energy Emission SIM, which should verify the Energy Emission model criteria discussed above, and that project is progressing. Thanks Michael for the highly relevant link, and for insisting that media be a responsible mechanism for distribution of positive conceptual Energy in the Universe. Please do pass me e-links relevant to this discussion... e.g. Nassim Haramein Energy Distribution model within a Tetrahedron CAD environment... and I will keep you e-posted on UQS e-publications.